Experience this special 2-hour cruise on beautiful Lake Coeur d’Alene that offers a unique opportunity to experience nature’s finest in the winter months! TICKET PRICES: Adults: $26.26 Seniors (55+): $24.25 Children (6-12): $18.25 5 & under. Last year was so fun, let’s do it again! It’s that time of the year… parties, too much food and drink, and of course ugly Christmas sweaters! Trail Maniacs would like to combine those time honored traditions AND we’ll even throw in a little help for those less fortunate. Doors open at 6:15 and Mystery Theater begins promptly at 6:30 pm and ends around 9:30pm. This is a paperless ticket, please bring your I.D. to the event. Ticket cost covers a seat for the show and one “house” beverage, including wine, beer, or non-alcoholic beverages. We look forward to seeing you there! 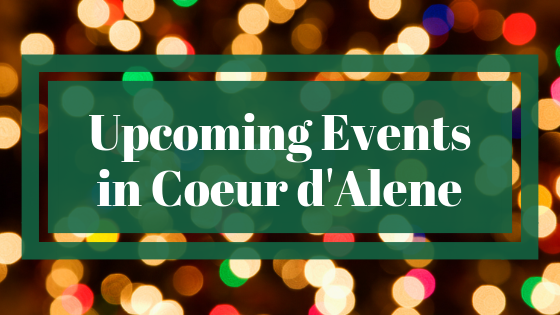 Join us for family fun holiday events Downtown Coeur d’Alene! The Coeur d’Alene Downtown Association is partnering with First Presbyterian & Trinity Lutheran to bring you a Live Neigh-tivity! There will be a live animal petting stable, manger scene photo booth, carolers, hot chocolate, coffee, and gifts. Affiniti will once again bring the magic of “A Celtic Christmas” to The Kroc Theatre this year. Harpist Teresa O’Donnell, violinist Mary McCague and sopranos Emer Barry, all classically trained Irish musicians delight audiences around the world with their unique sound of classic Christmas music! You are invited to Christmas for Kids at The Vine Church (9407 N Government Way) on Saturday, December 15th, from 10:00-12:00, for children ages 3-12. It’s a fun day of Christmas activities, crafts, songs, creative learning activities, cookie decorating, Christmas video, the Christmas story, and more! This year Emerge is expanding our Holiday Market event to encompass the entire weekend. Featuring work by local and regional artists! Come down to Frontier Ice Arena during our 12 Skates of Christmas! Enjoy a cup of cocoa from Santa’s Cafe or skate with friends and family in a winter wonderland! You don’t want to miss this amazing season on the ice! Here’s your chance to ski a run or two with Santa! Living in the North Pole sure gives him plenty of opportunity to practice his turns but there’s nothing he loves more than taking a skiing break at Schweitzer! So come on and take a run with Santa over the holidays! Traditions of Christmas is a Radio City Music Hall style show which includes beautifully choreographed kickline tap numbers, Santa’s workshop, a heartfelt military tribute performance and a grand Nativity conclusion. Featuring a cast of 70 people, spectacular sets, live animals, and over 400 costumes! Christmas Eve Ski with Santa on Christmas Eve! Christmas Day Join us in Noah’s for a Christmas feast! On Saturday, Christmas Eve, Santa leads a balloon parade to the village from the top of the Basin Express chairlift. This is a great photo opportunity and is free for the whole family. HAPPY HOLIDAYS! 2018/19 NEW YEAR’S EVE ACTIVITIES Tickets for all NYE parties go on sale December 1st, 2018 at 12:00am. New Year’s Eve buses will run on typical night skiing schedule. This means the last ride up will leave the Red Barn at 8pm. Bring the kids and celebrate on the lake for a fireworks show to kick off America’s New Year as it first comes in on the east coast. Our cruise departs at 8:00pm for the show set to blast at 9:00 (Midnight Eastern Time). Featuring family-friendly music, entertainment, no-host beverages and much more!